My name is Emelyn Schaeffer and I am from Atlanta, GA. I am approaching my sophomore year at Davidson and I am thinking about double majoring in English and Gender and Sexuality Studies. 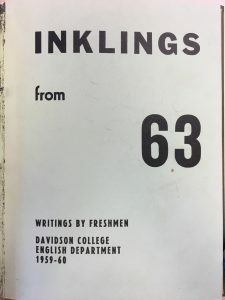 I am excited about working in Archives and Special Collections this summer, learning more about how the library operates, and discovering more about Davidson’s past. 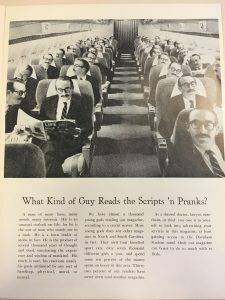 This weekend is Alumni Reunion Weekend for Davidson and we are collecting some publications written by members of the classes attending to showcase during Saturday’s Avant Garde lunch. It is the class of 1963’s 55th reunion and they are being honored with an induction into the Avant Garde. With this in mind, we took a peek into what life was like on Davidson’s campus in 1963. 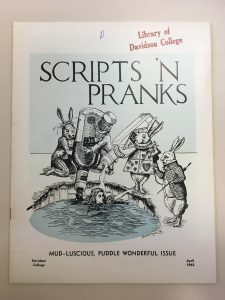 The spring issue of Scripts ’n Pranks – a literary and satirical magazine published for students to showcase their classmates’ work – in the 1962-1963 school year is called the “Mud-Luscious, Puddle Wonderful Issue” and features an Alice in Wonderland inspired cover. 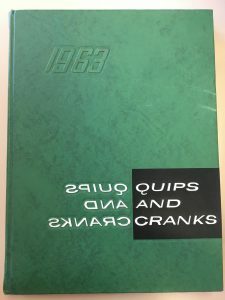 The class of 1963 was the first one for which Inklings was published, a collection of writing from the class during its freshman year. It includes a mix of genres, from fiction to articles on current events. Back-to-back articles include “How Great Thou Art” and “Man in the Age of the Hydrogen Bomb,” which could point to some mixed feeling on the future of the world. While I, as a Davidson student, laugh a little at these passages because of how they echo some of my own thoughts as I look towards my future, I hope the alumni of this class now look back on their time at Davidson with a heart full of pride and love for a place that properly prepared them for all they thought to attempt and succeed in doing. Many things may have changed on this campus and in this world in the last 55 years, but the traditions we share – the Freshman Cake Race, the Honor Code, outlets of creativity, hard work, and love of this school – will forever connect alumni and students.